The Google +1 button just got a lot more useful -- and a lot more like Facebook's "Like" button -- by adding the ability to share +1 recommendations with other people on Google+. Google is rolling out this feature over the next week, but you can check it out immediately by signing up for the Google+ Platform Preview. With the new feature, clicking the +1 button on a Web page (such as this one) displays a text box for sharing a link on Google+. If you click the text box, a larger menu appears for typing in a comment and controlling which of your Google+ social circles will see the link. It's been a long slog to this point for the +1 button, which Google introduced in March as a way to endorse Web pages in search results. Back then, the button didn't have much purpose because Google didn't have a social network to match. The only people who saw your +1 recommendations were the ones who had you listed as a Google Talk contact. 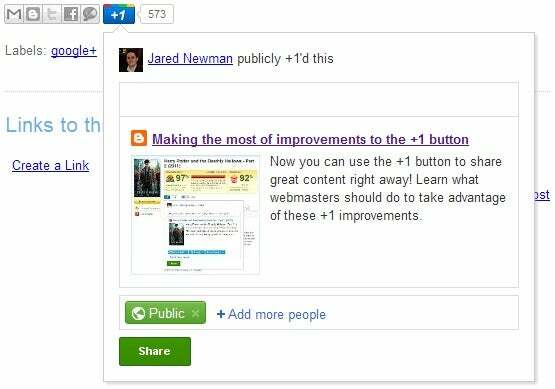 When Google+ launched in June, the +1 button suddenly had a much larger network to draw upon. But until now, clicking +1 had no effect on your Google+ timeline. Facebook's Like button worked in reverse. From the start, liking a Web page created a link in the user's timeline. The social network already had a huge user base when the Like button was introduced in April 2010, and webmasters quickly recognized it as an easy way to get more traffic. The Like button spread throughout the Web. Only then did Facebook and Microsoft start blending Facebook Like data into search results. With their respective recommendation buttons, Facebook and Google bring different strengths and weaknesses to the table. Facebook's network is larger, and the Like button has been around longer, so the potential is greater to see recommendations on any given Website. But Google operates the world's largest search engine, and social circles allow users to target each +1 at the groups that are most likely to appreciate the link. Fortunately, this isn't a zero-sum game. Liking a page doesn't preclude you from giving it a +1, or vice versa, and the process for endorsing a page through either method is quick and easy. I expect both Facebook's Like and Google's +1 to prosper, even as the competition between the two social networks gets fiercer.